This August I met two of the most important mite pests in North America. The two-spotted spider mite, Tetranychus urticae Koch (Prostigmata: Tetranychidae) is particularly devastating in greenhouses. That’s where I encountered it – slaughtering my dill. The common name ‘spider mite’ refers to the vast quantities of webbing they produce. 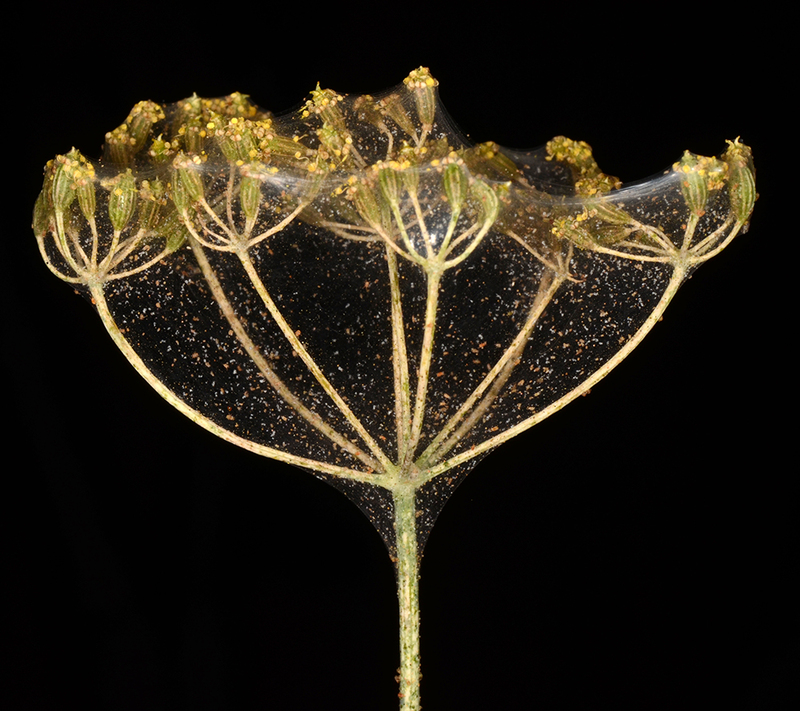 Tetranychus urticae and its webbing on my unfortunate dill plants. 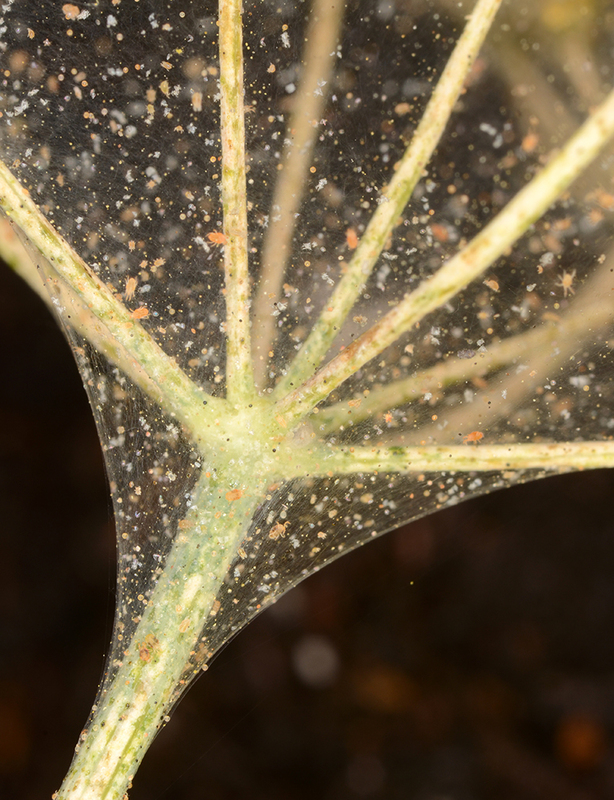 Closer view of webbing, showing the mites themselves. This spider mite has a huge host range, having been recorded from more than 1000 plant species. It feeds by piercing host tissues with its fine stylet-like mouthparts. 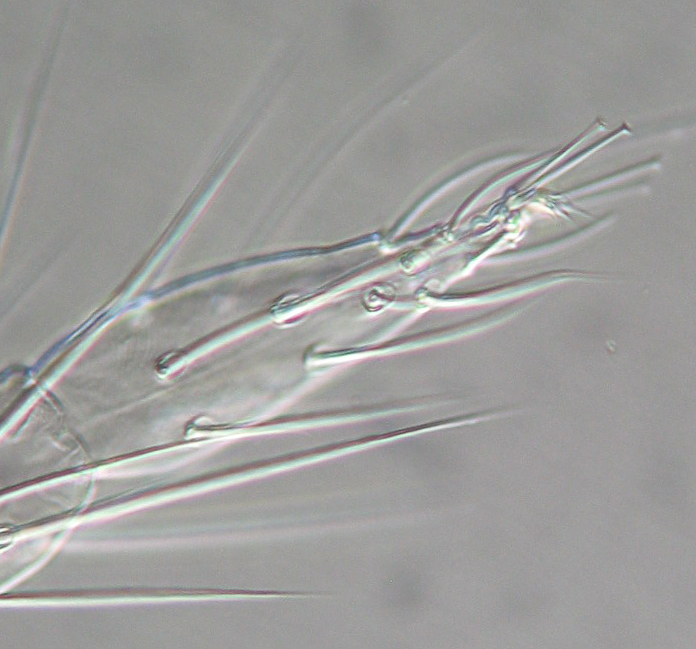 Tetranychus urticae female: above, whole body; below, gnathosoma showing stylet-like chelicerae. The name ‘Tetranychus‘ means ‘four claws’ and presumably refers to the four nail shaped setae (tenent hairs) on the tarsi. Why ‘urticae‘? Because they are irritating, like nettles (Urtica spp.)? Or maybe they were first identified from urticaceous hosts? 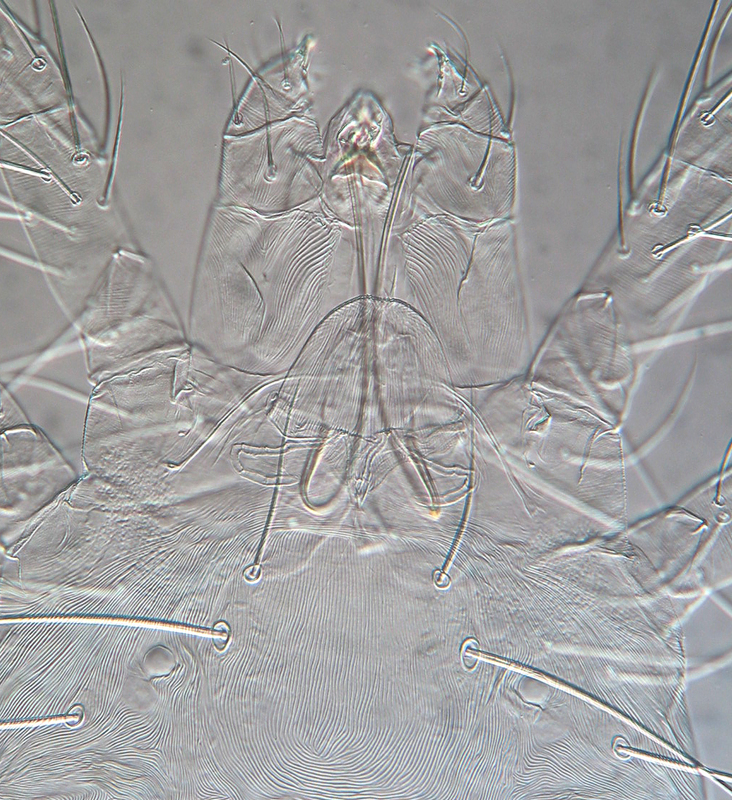 Four nail-like tenent hairs can be seen at the tip of this mite’s tarsus. Tetranychus urticae has made the big journals lately for having the smallest known genome of any arthropod, and for having likely picked up genes for producing carotenoid pigments by horizontal transfer from fungi. Until recently, it was thought that all animals acquired carotenoids from plants, bacteria or fungi in their diets rather than creating the pigments through their own metabolism. But pea aphids and T. urticae are able to make carotenoids themselves, thanks to these horizontally transferred genes. The other bad mite I met in August has a much narrower host range – bees of the genus Apis, including the domesticated honeybee Apis mellifera Linnaeus. 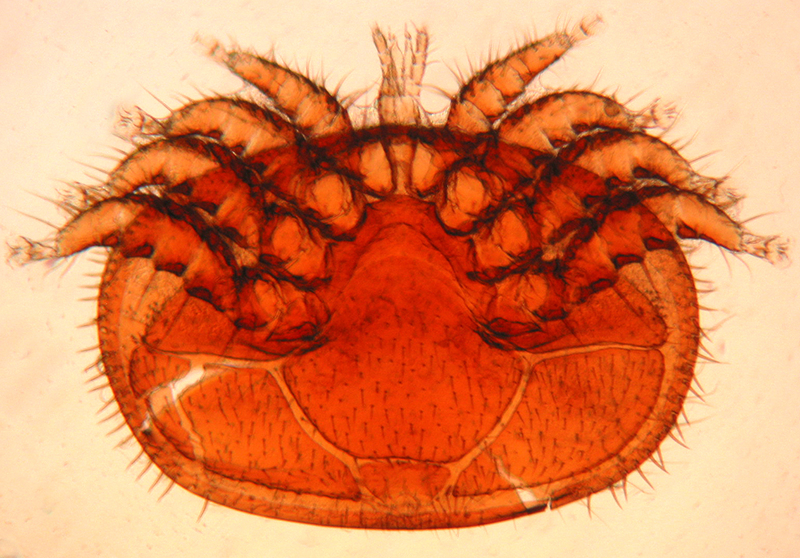 This mite is the infamous Varroa destructor Anderson & Trueman (Mesostigmata: Varroidae). These parasites are huge relative to their hosts, being about the size of the bee’s eye. They feed on host haemolymph, thereby weakening the bee, and can transmit crippling viruses. Although I don’t have honeybee hives in my backyard, one of my previous graduate students is a member of YEG Bees and was taking part in the first trial of urban bee-keeping in Edmonton. He invited me to one of their hive checks. Part of the check involved looking at the sticky boards under the hives for Varroa that had been knocked off the bees. Sure enough, they were there. 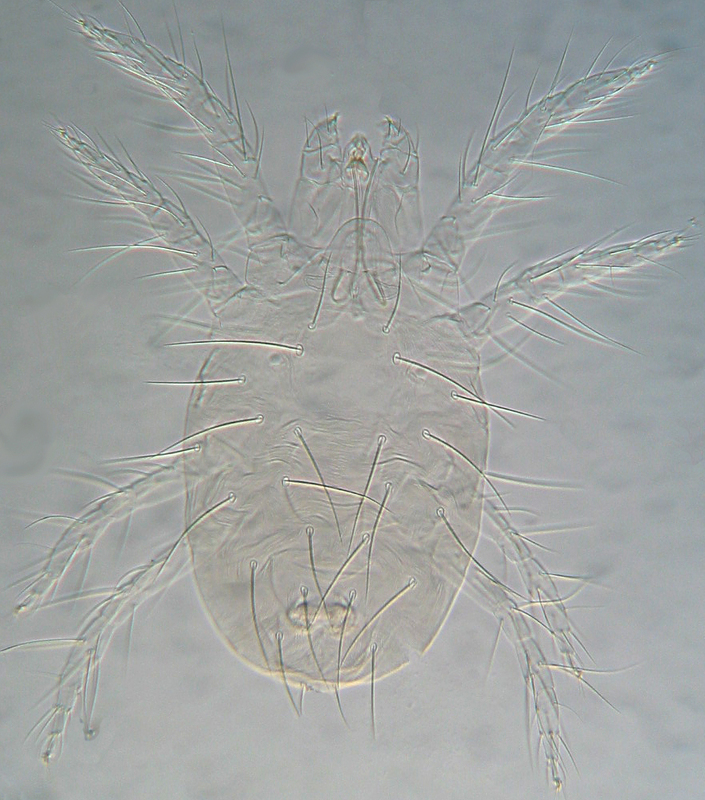 I collected a couple and managed to get an ok photograph of one of the vaseline-covered mites. A Varroa destructor from Beeyonce’s hive. The queen of the other hive I visited was named Justin Beeber. Beeber’s hive failed – prophetic? A V. destructor, after having had vaseline removed via a fine probe and Photoshop. 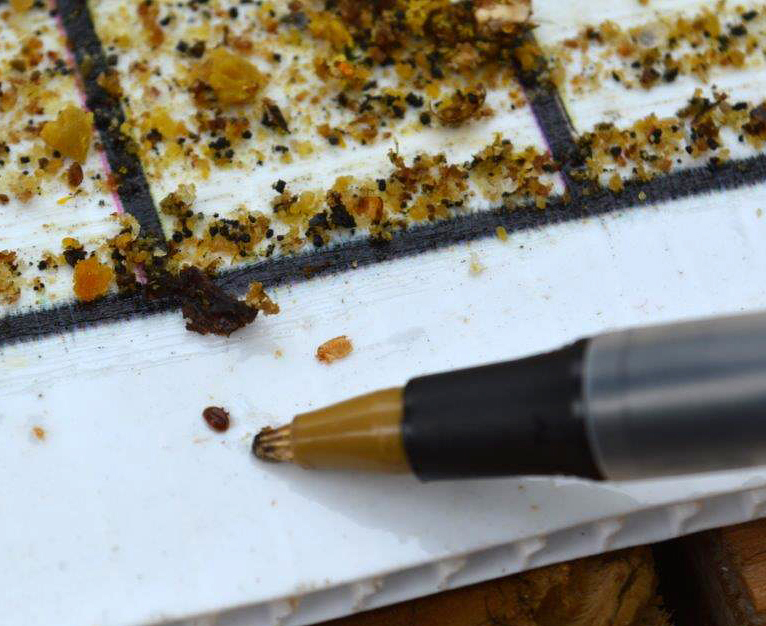 Varroa can be treated with chemicals or through careful selection of mite-free brood starters. But it is getting harder to find the latter, as V. destructor is found in almost every Apis mellifera-producing country except Australia. Researchers and apiarists are also trying to breed a more Varroa-resistant honeybee by selecting for intense grooming behaviour. On the one hand, these two species tarnish the image of other mites through their economic nastiness. But on the other, their bad behaviour helps to pay the salaries of many acarologists.